The first time I ever heard the word grunt I was standing on the set of MasterChef Canada Season One. The winning home cook had the pleasure of choosing one of three Canadian desserts that the rest of the home cooks had to “re-invent”. The options she had to choose from were a butter tart, a blueberry grunt or Nanaimo bars. Luckily she didn’t choose the blueberry grunt because I had never heard of it before. Since that Elimination challenge, I have been curious about this Canadian dessert – a blueberry grunt. I checked online to see if there have been any variations on it through other blogs but I couldn’t seem to find anything. I am not going to give you a history or a recipe of the classic blueberry grunt here. It hails from Nova Scotia and it’s basically blueberry pie filling with a biscuit dumpling topping. I decided to develop a grunt recipe akin to my favourite type of pie, strawberry rhubarb! My recipe was first featured in a private magazine publication I worked on for Lady York Foods in Toronto. I love developing new recipes based on the client’s needs. It is such fun – I get to test out recipes that have been looming in my brain! I added a bit of ginger to the biscuit dumplings for a different flavour. They are so tasty that I was tempted to eat one of the dumplings on its own! The recipe can be made just before you are ready to serve it. It tastes great warm with a heaping scoop of vanilla ice cream on top. If it sits too long, the biscuit dumplings absorb the syrup and it isn’t too pleasant. I hope you enjoy my take on this old-school Canadian dessert! *Don’t use frozen strawberries or rhubarb for this recipe as they release too much liquid. Make the topping: Mix flour, sugar, baking powder, ginger and salt in mixing bowl. Using large holes of box grater, grate butter on top of flour. Combine with fingers until mixture resembles coarse meal with some pea-size pieces of butter. Add vanilla and stir in milk until wet dough forms. Cover and refrigerate while making the strawberry and rhubarb filling. Make the filling: Chop strawberries and rhubarb and mix in a bowl with 1 Tbsp sugar. Let sit for a few minutes. 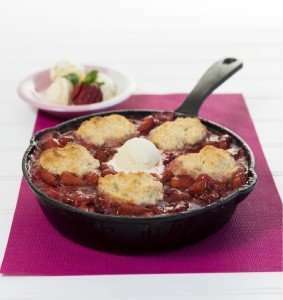 Using a slotted spoon, add your strawberry and rhubarb into a large pot, leaving behind any excess water that has come out of the strawberries and rhubarb. In the same pot, combine the remaining sugar, orange juice and lemon zest. Place over medium-high heat. When mixture comes to a boil, cook stirring, 7 minutes. Mix together lemon juice and cornstarch; stir into strawberry mixture. As soon as it returns to a simmer, using a slotted spoon, transfer to deep 12” by 8” baking dish or 12” cast-iron skillet and leaving about ½ inch of space from top of skillet. Pour some of the syrup from the pot over your grunt being careful to leave space at the edge to prevent overflow. Dollop dough on top of filling – each dollop will be about ⅓ cup. Bake until topping is golden and cooked through, 25 minutes.